One way for couples deciding to divorce to save time and money is mediation. 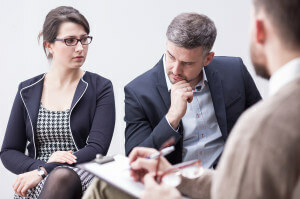 People going through a divorce may choose to use a couple preliminary mediation sessions to decide whether the parties can reach a settlement before even filing for divorce. If divorcing parties decide to test out the mediation waters beforehand, it may be beneficial to hire an attorney to represent you in the mediation process. An attorney can be utilized at any point in the mediation process: whether it be to discuss your assets before the mediation and how those may be affected, or to guide you through decision-making in between mediation sessions. Be sure to contact our DuPage, Kane, Kendall and Will county family law attorneys to discuss the benefits of having an attorney guide you through mediation.